Sewing leather and denim can become a frustrating (or even impossible) task with the wrong sewing machine. Not only are most sewing machines not equipped to run over multiple layers of thick fabrics, but they also may run into bobbin issues, not to mention broken needles and tension issues when dealing with thicker weave fabrics. But don’t give up hope over your next leather and denim project, there are many heavy-duty sewing machines that are perfect for sewing more difficult fabrics and will turn your leather and denim struggles into a smooth sewing dream. Before investing in a sewing machine for leather and denim sewing, keep in mind how often you will be using the project. While a heavy-duty sewing machine is a great investment for sewers of any skill levels, it’s always a good idea to keep in mind how often you intend to use your new sewing machines. If you find yourself sewing leather, denim, and thicker upholstery projects every day, you may want to invest in a sewing machine made for upholstery projects. If you are looking for a sewing machine that can take on any kind of fabric, no matter how intense, check out our countdown to the Best Heavy-Duty Sewing Machine. Here are some things to keep in mind when looking for the best sewing machine for leather and denim. A good heavy-duty sewing machine for leather and denim will have adjustable foot height, as well as heavy-duty needles and a stronger construction to hold up to the intensity needed to stitch through leather and denim. In many cases, these sewing machines are specially crafted to have more durable internal parts and are tested to ensure they hold their tension and bobbin speed while breaking through heavier fabrics. No matter how durable the sewing machine, however, it’s always a good idea to take it slow when sewing thicker fabrics, so you can make sure you get a straight stitch without accidentally tangling your machine. Without further ado, here are the best sewing machines for leather and denim. The TOYOTA Super Jeans J34 Sewing Machine is a good starting option for sewing jeans and denim. It’s multiple foot attachments and extension table make it perfect for sewing more complex projects, and its variety of stitch options make it ideal for sewing both thicker fabrics and traditional sewing projects. Plus, its ability to “glide over 12 layers of denim” makes it indispensable for any denim or leather sewing project that might need that extra kick. However, as mentioned by one reviewer, “does stitch really nicely through thick items with a normal to loose weave. It has trouble though when it gets to tighter weaves,” meaning it is not the best sewing machine available for other heavy duty projects. While this machine is sure to help you get the job done, it’s not as multipurpose as some of the other options on this list, but still a worthwhile investment for anyone looking for a sewing machine that can take the frustration out of sewing leather and denim. 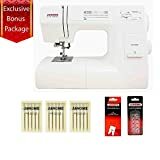 With 11 stitches to choose from, as well as an adjustable needle and a durable overall design meant to stand up to regular leather and denim sewing, this is a good mid-range option for anyone looking for a sewing machine that can tackle heavier fabrics, or one that will hold up against years of traditional sewing projects. As mentioned by one reviewer, “I work a lot of denim and other heavy material this handles all! !” And with a pressure foot that can be adjusted to fit any project, no matter how thick, this is a must-have for anyone who finds their sewing projects on the heavy side. 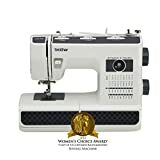 The biggest downside for this option is that the stitches are on the basic side, and the sewing machine arm is smaller than some more flexible heavy-duty sewing machines, but overall this is a fantastic sewing machine option for anyone who finds themselves sewing leather and denim, as well as thicker upholstery fabrics. If you’re looking for a simple, long-lasting sewing machine that can take any fabric or project in stride, this is the sewing machine for you. The Singer Heavy Duty 4432 Sewing Machine is built to last, with a stainless steel plate meant to take on the toughest of projects. And with 32 stitches to choose from, this is the perfect option for anyone looking to bring a bit of style to their latest project. If you doubt the durability of this machine, don’t take our word for it, take the word of one of the reviewers, who’s Singer Heavy Duty 4432 Sewing Machine “ was able to machine the leather I was working on for my sofas,” proving this is a fantastic option for anyone taking on intensive projects that need a real kick in the seams. Jam-proof bobbin system, multiple, and stitches to choose from, and a design that won’t pull or bunch your fabrics, makes this the easy choice for our #2 spot. With adjustable foot height and pressure, as well as a durable design made to stand up to heavy-duty use for years, the Janome HD3000 Heavy Duty Sewing Machine is an ideal option for anyone who finds themselves taking on heavy-duty projects, but still wants the flexibility of a normal sewing machine. As mentioned by one reviewer, “this machine seems to be very comfortable with no babying or adjusting too much for thick fabric,” making it ideal for beginner sewers who are looking to take on more advanced projects, without worrying about broken needles or jammed bobbins. The Brother ST371HD is not just the best sewing machine for leather and denim, it is arguably the most versatile sewing machine on our list. Able to take on even the silkiest of fabrics to the thickest of upholstery projects, this sewing machine is the true winner when it comes to a heavy-duty design that doesn’t lose out on the other features on basic sewing machines. Like one reviewer pointed out, the Brother ST371HD “Has many features that more expensive machines have” in a price range that is almost unbelievable. This sturdy metal machine is a great option for sewing leather, denim, or anything else that might need an extra bit of love for your next sewing masterpiece.